in our Build Your Own AppaloosaTM program. Deposit Required Details at bottom of this page. We proudly show off the possibilities...Just LQQK!!! 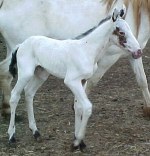 We started offering this program in 1999 when we realized we were turning away potential customers because we either had no foals to sell or we didnt have the specific bloodline cross our client was looking for. Perhaps because a foal had already been sold, was spoken for, in the "burner" or, we just hadn't gotten around to "building" that cross yet. 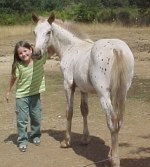 Sure, we could breed 15 -20 mares a year, and sell the resulting foals on the open market, but this is not what DreamCatcher Appaloosa is about. It use to be our practice to breed 3 or 4 of our mares a year, but, in todays economy and with the market so soft, we dont want a "foal overload". It begins with the customer choosing one of our stallions and one of our mares to cross together. All our stallions are available for this program. 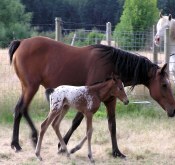 We handle the breeding and care for our mare through the pregnancy and the resulting foal is yours. 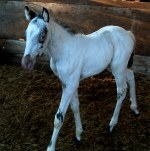 We will guarantee a healthy live foal. You have selected the Sire & the Dam. 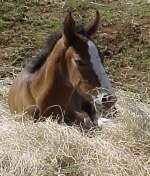 You're guaranteed a healthy live foal. your desired mare. A signed contract will be completed. 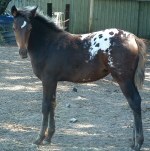 will be the amount due and that will reserve the mare for you. A signed contract will be completed. and before any breeding takes place.